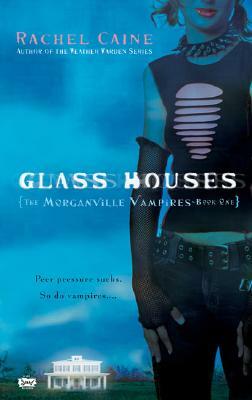 Glass Houses (Morganville Vampires #1) by Rachel Caine. Grades 8+ Signet (Penguin), 2006. 239 pages. Reviewed from library copy. Genius sixteen-year-old Claire Danvers was excited to start college and dreamed of attending an ivy league university... but instead her parents insisted on sending her to Texas Prairie University (also known as TPEwwww) since it's located in Morganville, TX, just a few hours from home. College is not all it's cracked up to be. Since insulting one of the queen bees on campus, Claire's become the target of dangerous hazing in the dorms. Since quitting school and slinking back home is not in her vocabulary, Claire looks for an off-campus solution and finds herself the newest resident of Glass House, sharing digs with three older kids. But something is not right in Morganville and all too soon Claire's caught up in the violence and power struggles that permeate the town. If you're looking for sparkly vampires, move along. In Morganville, the vamps are not messing around. I picked this one up on Katie's recommendation and I'm so glad I did! I absolutely can't wait to booktalk this series to my teens (um, after I replace the copies that have been stolen, that is...). The writing is witty and the dialog is SPOT ON. I can seriously buy all the banter coming from teenagers. It's not peppered with slang that's going to date the series quickly. And I love all the characters. Claire is scrappy and tenacious. 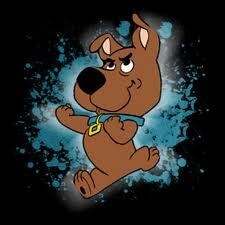 Seriously, she's like a non-annoying Scrappy Doo. She might be little, but there is no stopping her from doing something she's determined to do. Like attend calculus, even though there are vamps and militant mean girls hunting for her. And she's super protective of her friends, even though they're all older and wiser than she is. And also, I love how she lied about knowing how to make tacos. HA! There's a lot of action, big bad vampires (there are NOT Twilight vampires! ), and a dose of steamy romance towards the end. And also, the first book ends on a big ol' cliffhanger!!! So make sure you replace all the stolen copies at your library so your teens can find out what happens next. Glass Houses probably most reminded me of Buffy the Vampire Slayer since it features teenage kids pretty much on their own against the Big Bad (not to mention the witty dialog). I'd also try it on fans of Vampire Diaries, Meg Cabot's Mediator series, and Scott Westerfeld's Midnighters series (which is, in my opinion, a grossly overlooked awesome supernatural series).